The European Union is preparing the ground for a raid on one of the crown jewels of British business. The bloc proposed rules on Tuesday that would give it the power to force a large slice of London’s financial services to move out of the city after Brexit, putting at risk an estimated 83,000 jobs. Despite not using the euro itself, the U.K. acts as the primary go-between for buyers and sellers of financial products priced in euros that play a vital role in Europe’s economy. Known as euro clearing, it’s a massive business involving transactions worth as much as $1.5 trillion each day. Rival financial centers such as Paris and Frankfurt have coveted the lucrative activity for decades but have failed so far to loosen London’s grip. The European Central Bank has long argued that the clearing of such vast quantities of trades should take place inside the group of 19 countries that use the currency. The bank says it needs to monitor what’s happening to ensure the financial stability of the eurozone. 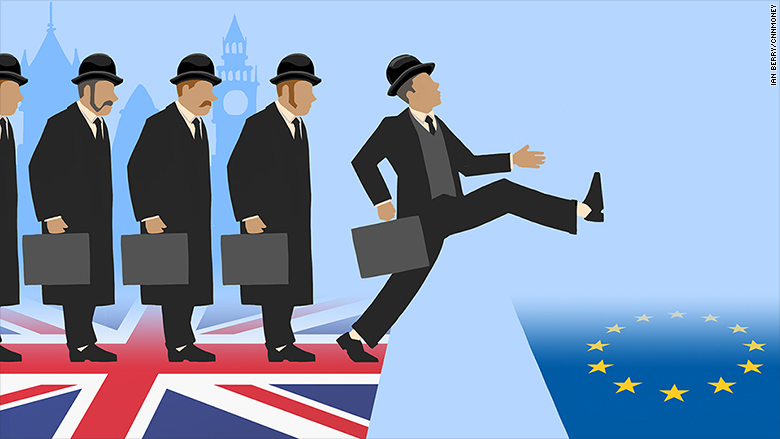 As long as Britain remained in the EU, the central bank wasn’t able to force London to drop the business. But now Britain is set to ditch the EU, all bets are off. The proposal from the European Commission says that allowing the clearing houses to be based outside the EU could pose a risk to the continent’s financial system. It recommends that regulators have the power to require “a limited number” of systemically important clearing houses to be based in the EU. “We need to adjust to the fact that the EU’s largest financial center will be leaving the EU … and we need to see how we can still ensure financial stability given the significant share of euro clearing which is done in London,” said Valdis Dombrovskis, the Commission’s top official for financial markets. The rules still need to be debated and approved by EU states and members of the European parliament. The U.K. has lobbied hard to keep the clearing operations in London. Its main argument is that moving the hub could cause havoc. The damage to London could stem from the jobs that would disappear if clearing operations are forced to move. While the number of people employed directly by the four clearing houses that handle the majority of transactions only numbers in the hundreds, the supporting infrastructure is massive. The London Stock Exchange owns the biggest clearing house. It commissioned a report last year that found up to 83,000 British jobs could be lost over seven years if the activity moves out of London and into the eurozone. Dombrovskis said forcing clearing houses to move would be a “last resort” if European regulators such as the ECB felt they were unable to ensure stable markets via a system of “dual supervision” with British authorities. The London Stock Exchange said it supported “regulatory cooperation” because it provides “economic efficiencies” for customers and the wider economy. “A location policy does the opposite, it increases, not decreases, risk and costs for customers. Given these facts, European and global customers have overwhelmingly expressed a clear preference for shared regulation between the EU, the U.K. and the U.S.,” it said in a statement. The City of London Corporation, which represents the city’s financial district, said moving the business could unnecessarily damage the EU by pushing up costs for companies who use the financial products. “The EU is simply not equipped to handle the volume of clearing that the U.K. does each day,” policy chairman Catherine McGuinness said in a statement. Key market news. In your inbox. Start your day right with the latest news driving global markets, from major stock movers and key economic headlines to important events on the calendar. Daily newsletter, Sunday through Friday.